The Author of the Raggle Taggle Fleet. Ladislaw (Laddie) Reday came to Australia as a 2nd Lt US Army in 1942,with a group of US Army Officers who were to raise the US Army Small Ships Section by commandeering ,purchasing and leasing vessels that had a shallow draft from ports on the East Coast of Australia, Tasmania and New Zealand, which would be suitable to sail the then uncharted coast line of New Guinea. The crews consisted of men & boys who were too young, too old or medically unfit for service in the Australian Military Forces, they were hired on a six month contract. Their role was to transport American and Australian troops to the front line, bring back the wounded and the dead, and to transport any required stores consisting of ammunition, field guns, food ,medical supplies, gasoline, barbed wire, even tanks to the front line where they were fighting the Japanese Army to re take New Guinea. 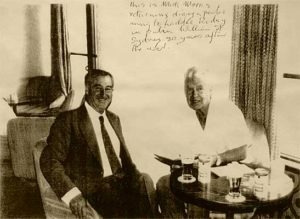 Ladislaw Reday kept a diary of these events until 1943 when it was left in a suitcase on a plywood landing craft which broke down on the Morobe River in New Guinea. Some time later a Mick Morris from the Australian Army Water Transport Unit, came sailing up the Morobe River and saw the abandoned landing craft, and being a bit of a scrounger,(his words not mine) went onboard and found a suitcase containing the diary and a pewter mug engraved Ladislaw Reday. In 1975 Mick Morris who was living in Sydney at this time saw in the paper that a Mr & Mrs Reday were house guests at the wedding of a Mr Jack Savage’s daughter, Mick Morris before the war had sailed with Jack Savage, so he rang Jack and confirmed that the Ladislaw Reday was the same person who served in New Guinea with the US Army Small Ships, Mick made an appointment to meet with Laddie Reday later at an hotel in William Street Sydney where the Case containing the diary and the mug were handed over. 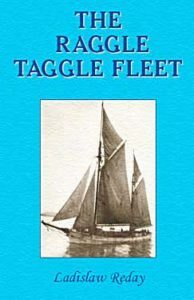 When Laddie Reday went home to the USA he wrote the manuscript of the RaggleTaggle Fleet and placed it in a cupboard together with the relevant photographs with the intention of editing it at a later date. Unfortunately he had a heart attack in 1987, his wife tried many avenues to have the book printed without success so it was placed in the San Francisco Maritime Museum for safe keeping. In the year 2000, I heard that there had been a book called the Raggle Taggle Fleet written, so I made enquiries in Australia without success, I then contacted a member of our association a William Colby who lived in California if he would make enquiries, and together with a friend a Mrs Norma Vindinoff they located the manuscript in the San Francisco Maritime Museum. The Museum agreed to sell the manuscript and Photo’s to the Small Ships Association and when they were received, I edited the manuscript and arranged for the book to be printed to the satisfaction of the Reday Family.